I have so many fond memories of Toulouse in the south of France, I couldn’t list them all here. Perhaps I’ll add a separate page just for this. I’ve heard that the city has changed a lot since I was there in 1997. It’s not the same friendly, open, safe place for walking around at any hour. But since I’ll most likely never get back, I can be happy in my memories of such a terrific ‘walking city’, at least as it was when I was there. 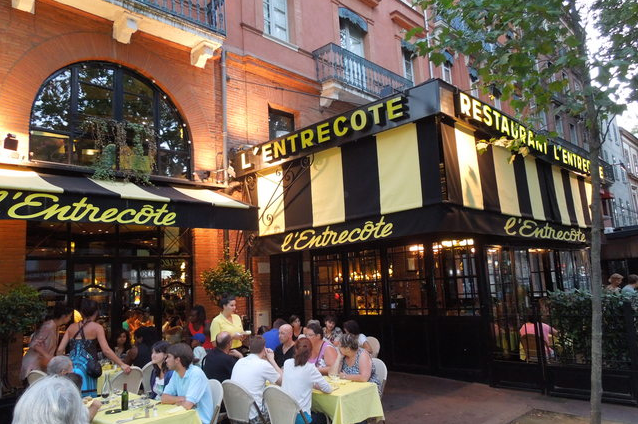 One of my favorite places in Toulouse is L’Entrecote Restaurant. Back when I was a teen and on one of many visits to Paris while living in London, I was fortunate to have the experience, now lost, French Fries stands along many of the main thoroughfares. Until my first trip to Toulouse, I had never had any Pomme Frites like those in the Paris of my youth. But when I tasted the fries at L’Entrecote, I was thrilled. This is how French Fries were supposed to taste. The outstanding entrecote beef dish which is their hallmark, was equally sensational. It seems to me that it’s very rare to re-experience something after 40 years and have it be just as you remember it. And we do remember. So getting to have this delightful occurrence, sitting at a sidewalk table on a beautiful Toulouse evening, is now a new memory I intend on retaining forever.